It's Social Saturday! And here is my favourite blogger - Sue from Sizzling Towards 60 and Beyond to kick things off beautifully! Thanks Sue for such a great post to start off my series. She even did a fabulous intro so I'll leave it to her to tell you how much we like each other and I'll just kick back and enjoy her post. HAVING THE PRIME OF YOUR LIFE RIGHT NOW! Midlife and Beyond, that is where we are and it is a wonderful time of life! Leanne is my BBB (Best Blogging Buddy) and we have known each other since we both started blogging about 3 years ago. Over that time, we have shared many conversations on the ups and downs of blogging plus life in general. We are so alike that we both agree we must have been ‘sisters in another life’. I was delighted when she asked if I would kick off her new Saturday Guest Series which I think is a great idea. On my blog Sizzling Towards 60 and Beyond, I have a weekly guest series, Over 50 andThriving, which I started this year. Some of you who follow my blog would know my philosophy on aging and retirement. I recently had my first gig as an MC and Guest Speaker for a Mother’s Day High Tea. The subject of my talk was having an Ageless Attitude to Life and I would love to share a few of these ideas with you today. It is all about STOPPING some of our negative habits and EMBRACING new ones. It is all about having the Prime of your life now – not waiting until some day but living each day with a positive and energetic attitude. How can we have an Ageless Attitude? The word ‘age’ can be so defining and limiting. The moment we focus on the number is the moment we start to grow old. Why should we be defined by our age and not our abilities? Because we allow ourselves to be. How did you feel when you turned 50?, 60?,70? I can say that I enjoy every birthday and looked forward to my 60th birthday celebrations last year. But then I just love a party! Some of us though find it difficult to accept aging and avoid birthdays after a certain age, mainly because we don’t want to face reality. It’s no good sticking our head in the sand. Aging is a normal process of life there is no stopping it or changing that fact. But what we can change, is our ATTITUDE. It is our attitude to living, not the number of years we have been on this planet, that should determine the quality of our life. We can live life obsessing about the number OR we can get out there and start living NOW. Like the title of my post says ‘Having the Prime of your Life, right now’. No matter what phase of life you are in , we should be making the most of every day and enjoying it. How often do you hear this? Maybe you even think it to yourself? Next time someone uses either of these phrases, call them out on it. We allow society to continue stereotyping older people so let’s get the message out there that our ability and achievements have nothing to do with age. Some of us have passed the ‘empty nester’ stage and others might just be experiencing it. For me, it is the perfect time to rediscover who you are. You have been a partner, mother, daughter, employee or business owner for so long that you forget who the real YOU is. Now is the time to embrace a new and exciting era. Don’t grieve the empty nest, embrace it. The same applies to retirement. This can be quite a shock to the system if you haven’t given it much thought and I know it really took me a while to find my place in this new world. Take the time to discover what you want from life and go for it. Having an Ageless Attitude to life is important but so too is living a healthy lifestyle. It is never too late to start and when I talk about healthy lifestyle, I’m not just talking about the physical side of things – being active and eating well. Having good mental health and making time for yourself is vital to living a full and active life. There are some things in life we just can’t change because they are out of our control. Looking back constantly and feeling resentment or anger will not help you live with an Ageless Attitude. You need to accept and let go of things you can’t change and move forward to better things. Do you think you have an Ageless Attitude? 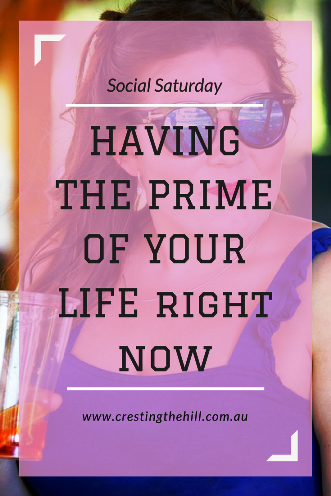 Are you having the ‘Prime of Your Life’? I would love to hear your thoughts and I invite you to join me over at Sizzling Towards 60 and Beyond - let’s get to know each other. Thanks Leanne for having me as your guest and I look forward to reading your future guests and their thoughts during Social Saturday. I've been waiting with baited breath for this series Leanne and what a fabulous blogger to kick off! Sue always hits the nail on the head when it comes to living with enthusiasm and living well as we get older - without the number. I agree it's always so debilitating to think, 'at my age I should' or have someone else refer to you in that way. Ageing is natural, we just have to get on with it and as Sue says, 'Have the Prime of our Life," and 'Thrive!'. Hi Jo, thank you for our generous comments and I'm pleased you enjoyed my thoughts. I know you and I have very similar opinions about aging - "it is a part of life but we don't have to dwell on it when there is a life to be lived!" I'm looking forward to Leanne's new series. What a perfectly timed read for me as I am celebrating my birthday tomorrow. Great attitude to have for anyone! Happy birthday Jennifer and I hope you have fun and enjoy your special day. Birthdays are to be celebrated and not feared aren't they? Well said Sue. I'm pretty sure I have an Ageless Attitude, because last weekend was my birthday and I had to use maths to figure out how old I was! Oh I love that Lise, having to use maths to figure out your age. Priceless! It shows that you do have an Ageless Attitude for sure and doesn't it make you feel good to be alive! Thanks for this, Leanne! I'm looking forward to more...I've had difficulty commenting, but will try again. Hi Diane, thanks for stopping by to comment even though you had some difficulty. Have a great weekend. 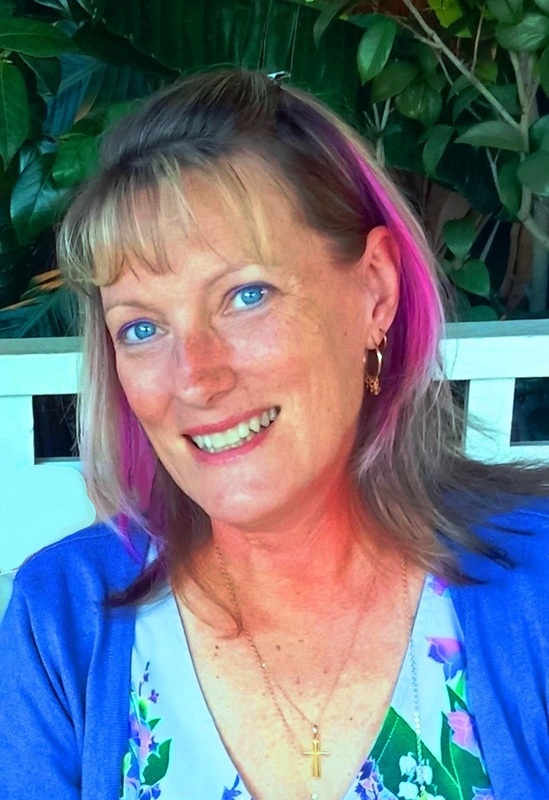 Hi Lori Jo, it is lovely to connect with you and I'm pleased you enjoyed reading my thoughts. I would love you to pop over to my blog and take a look, especially at my Guest Series, Over 50 & Thriving. Have a great weekend. I've definitely found my peeps! Hi, Leanne and Sue - What an awesome kick off post. I love the zest for life that each of you share. As usual - your tips are spot on! I greatly look forward to following this series. Hello ladies. I have to say right now I am kind of in a rut. It is a self imposed rut because of husband diagnosis and I know it won't last forever and I will be back to living my life at full speed. What a great way to kick off your new guest series, Leanne! You knew Sue would do it right, and she did. I am happy to say that I love this time of my life. I have close relationships with my children and grandchildren, but am no longer primarily responsible for them. I'm still working, but looking forward to retirement and the freedom that affords. I am healthy--thanks to good genes and taking care of myself. I sometimes worry that time is passing too fast, but then I stop and enjoy the current moment. So everything is not perfect, by any means, but I believe I am having the prime of my life. Thanks ladies! 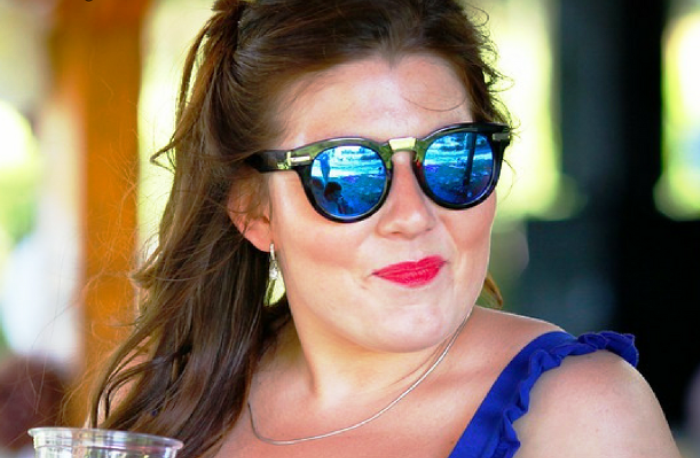 You certainly are having the prime of your life, Christie as are many of the women I have met through blogging. I think our generation rocks and we are great role models for our children and grandchildren. It is an amazing time of life isn't it Christie? Nobody even hinted to me that this stage would be as great as it is. I don't know whether blogging made the difference or not, but I just love being "me" atm - especially with a lovely husband, independent adult kids and a beautiful granddaughter - life is indeed good! Hi Kathy! Leanne and I live on the opposite side of Australia to each other so we haven't as yet met to have a coffee IRL. We are working on that! I so agree we need to get the positive message out about aging and your thoughts on looking at 'getting older as a benefit - not a downhill event' is spot on! As always, beautifully said, Sue...and congratulations on a sizzling start to your new series, Leanne. Oh thank you Jo! Have a beautiful weekend and I appreciate your continued support. Good for you Alana that is certainly the right attitude to have. We can look at life in a negative way and view getting older as slowing down or we can take life's twists and turns and enjoy the ride. I think you are enjoying the ride! There are always the physical aspects of the aging process that scare us a bit at times Alana - but they also serve to do exactly what you describe - they make us appreciate the time we have and making the most of these next couple of decades before thing really start to slow down. Hi Sue - there is nobody who I would have picked to start my series off other than you! Your guest series (and Donna's) have shown me what a bonus it is to have other bloggers share their wisdom and to hear different voices sharing their Midlife wisdom - I'm so pleased with how keen people have been to offer to write for me! Age is just a number - It's a good attitude to have. Hi Suzy, I think it is a great attitude to have because then we don't put ourselves in a box by saying 'we are too old'. Have a great week and thanks for stopping by to comment. You're right Suzy - I think it's a good attitude to have too because when you drill down to it, age really is only a number until we let it affect how we live. I've been singing the whole way through this post... and I've a terrible singer! "Now I've had the time of my life...No I never felt like this before... Yes I swear It's the truth"
But yes, I can attest that I am having the best time of my life right now! I'm trying to be holistic in my life approach and let go the fact that this body is not going to do some things it used to any more....but that's OK. There is plenty still to enjoy! I'm not a great singer either Pat, but that hasn't stopped me before LOL:) It is such a wonderfully warm feeling that I get from women like you and others who have such a positive attitude to this time of life. I'm glad I've found such motivating and inspirational women in my life. You are right there is still plenty to enjoy! Have a great week! Pat, you, Sue and I could start the Really Bad Midlife Singers group - I'm sure we'd be a hit on karaoke nights!! And I completely agree - this stage of life has been a well kept secret - it's amazing! Great kickoff post, Leanne. Sue, if these are the messages you shared at the tea, it's no wonder you were a big hit! They're important messages for all of us to hear and to remember. I'm with Pat above in feeling that I am at the best time of my life right this very moment and I'm going to make it last just as long as I possibly can. I'm thinking 30 years isn't unreasonable. Whatcha think? Hi Karen, yes it was and I'm going to publish my speech over the next couple of weeks so if people are interested they can read it. 30 years at least, my friend! It has been great to connect with such positive women, who aren't feeling sorry for themselves and just getting out there and enjoying their life. Enjoy! Awesome post, Sue and Leanne! I'm enjoying the best time of my life right now, and stretching my 'go go' years as long as I can. 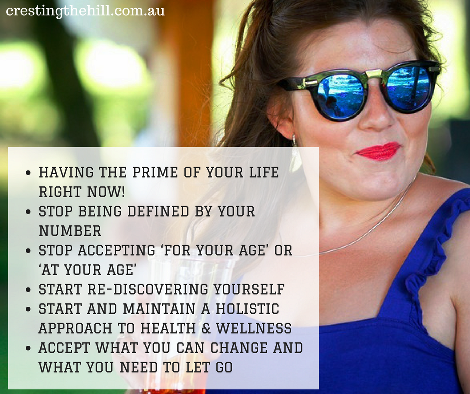 I'm loving this stage of life too Natalie - it's been such a surprise to discover how great Midlife is and I'm planning on stretching it out too! Indeed, age is just a number. Every day is a new day, that is what I always believe. And as we age, we must be realistic regarding what we can achieve and what we need to let go. Good post, Leanne. Enjoyed reading this. You have such a great attitude about this stage of life. Age is just number. I feel better and look better now than I did ten years ago. I am interested in your talk, I have a peaking engagement coming up in July. I've given hundreds of talks and workshops, but this topic is a new area for me. I am glad people are speaking out about aging in a positive way! Thanks Leanne and Sue. You have hit on some wonderful and relevant points to be going in the right direction. We will feature this to have your post to be an encouragement to others. I’m playing catch up and realised I’d missed this great post about one of my favourite bloggers 😊 A timely reminder for all of us Sue, you are such an inspiring person, I just love your tips to living a better life at any age. Thanks Leanne for your fab new series. Studying this information So i'm satisfied to express that I have an incredibly just right uncanny feeling I discovered just what I needed.